As previously expressed (here and here) for the longest time, pastry really made me anxious. I’ve recently gotten over that. Now that pastry isn’t so daunting, I have been feeling more brave and creating some tweaks and changes and moving with intuition more than rigid recipes. About a month ago when I tackled apple pie, it was good. Definitely successful, but old fashioned, and as good as it was, nothing very interesting. Since then I have come up with this little tart, and I have to say, I’m quite proud of it. The flavour combination is … unexpected. But it’s delicious! 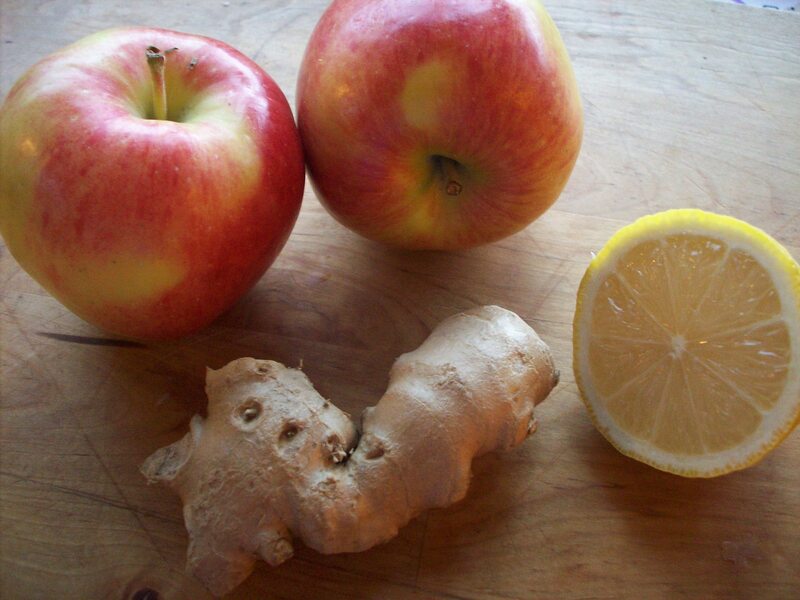 It just isn’t your Granny’s apple pie. 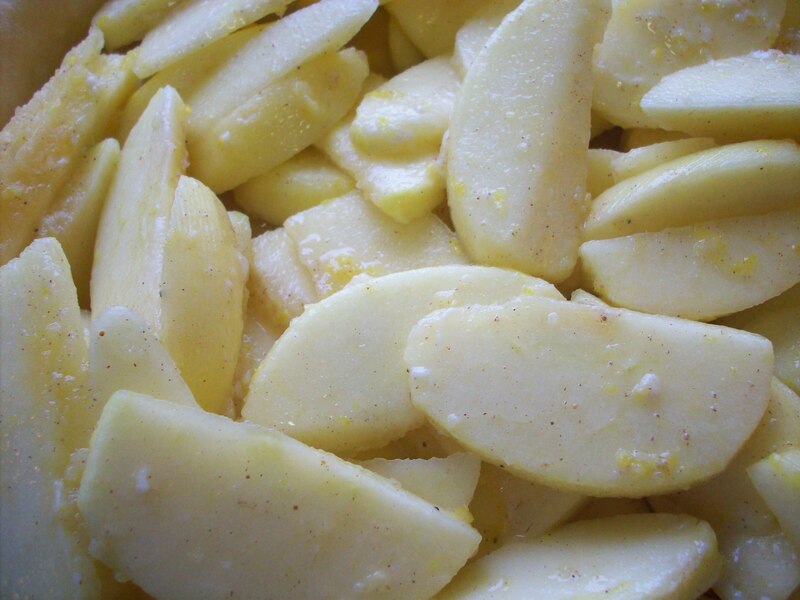 It gets it’s unique taste and warmth from a serious hit of lemon (juice and rind) and a dollop of fresh grated ginger. 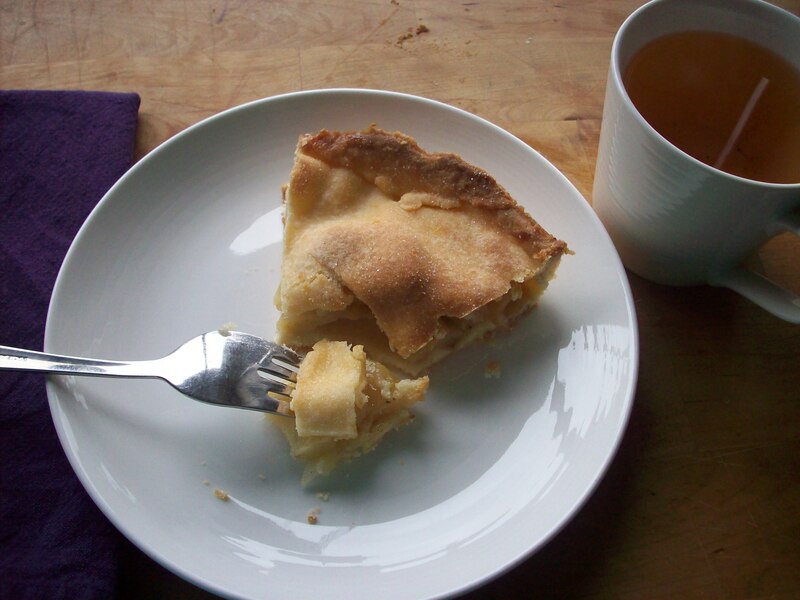 Along with these atypical flavours are the warm notes of cinnamon, clove and nutmeg which, as more familiar pairings with apple, remind you that you are, indeed, eating an apple pie. I also tried a different look with this tart. 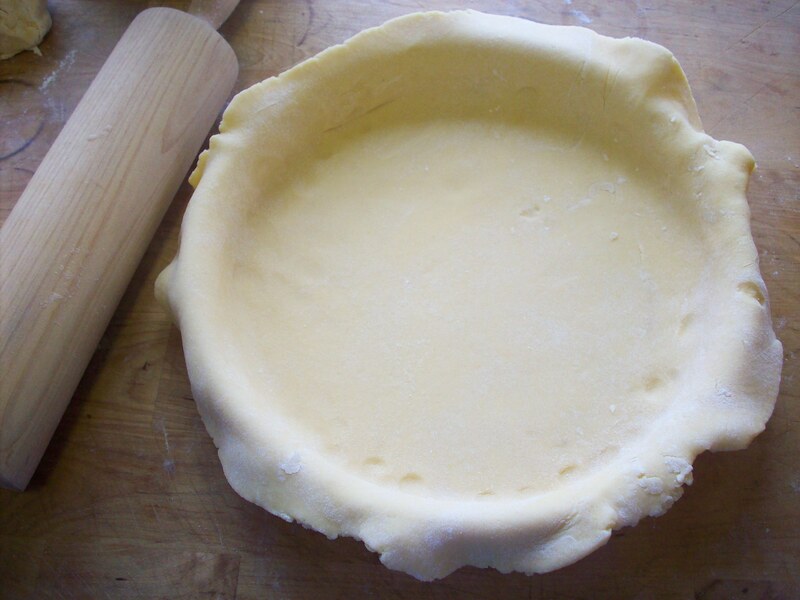 Instead of making a top crust with a fluted edge that doubles up with the edge of the bottom crust, I rolled 1/2 the pastry out and draped it into the dish (10 inch round, 1 inch high) and let the excess hang over. 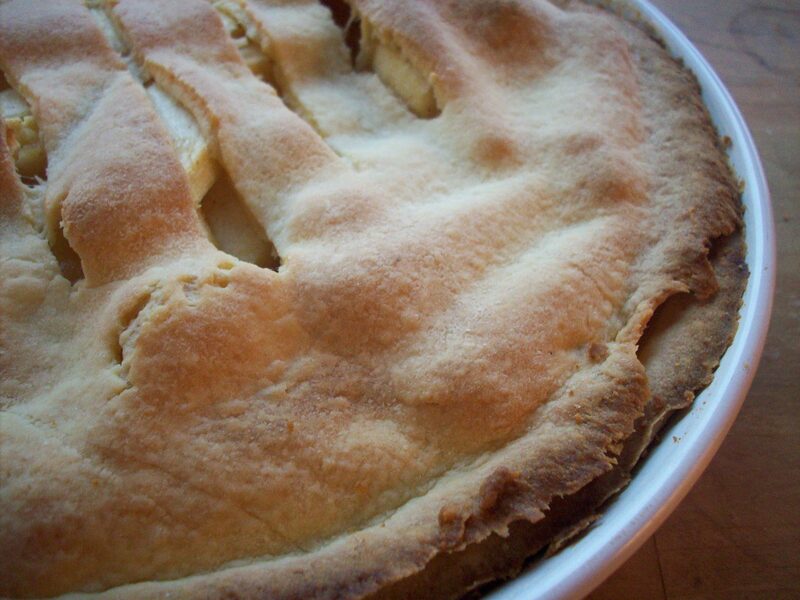 Then, I drove over the top edge of the pie plate with the rolling pin and cut off the excess. After adding the filling, I rolled out the top crust and “cut” it the same way, made some steam vents and baked it. The result was that the top and bottom crusts both shrunk a bit and remained un-fused, but browned nicely leaving a low profile crust. Maybe not the way to do every pie, but it seemed to fit the personality of this one. Ta da! To finish it, I glazed it with a bit of warmed peach jam for shine and a very light sprinkling of sugar for a bit of crunch (apricot jam would be good too, or just leave it plain.) Here’s the recipe …. Pulse just until the mixture is incorporated. It will be a little sticky. Squeeze it until it comes together and makes a smooth ball, use a bit of flour if it’s too damp to do so. Then split the ball in 2 and roll out the first half. Lay it into your dish and roll over the dish edge with the rolling pin to trim it. Roll out the second half on a sheet of parchment paper or waxed paper and just rest it into the dish with the bottom crust while you make the filling. Put them in the fridge so they stay cold. Peel and core 6 medium sized apples. (I have used Ambrosia, Honeycrisp and Fuji, all with great success). Halve the apples and slice each half into 8 into the bowl with the lemon juice, etc. 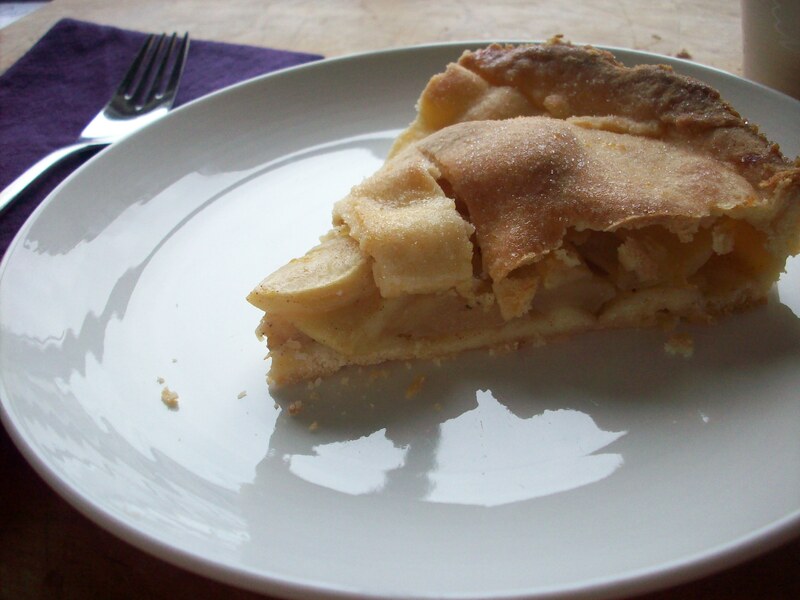 Remove your pastry from the fridge and fill the pie with the apples and whatever syrupy juice is in the bowl. 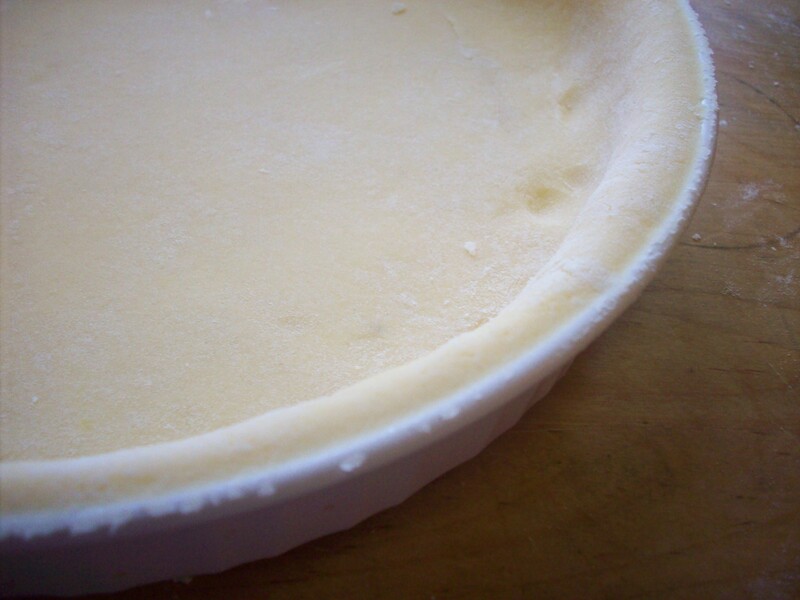 Top with the top crust and use the same rolling/cutting technique with the roller (or if you love bog fluted edges, do that). Cut some steam vents in the top and bake it for 45 mins at 400. Allow to mostly cool before serving … if you can wait that long.